Kentucky is the source of 96% of the world’s bourbon, the bougiest sport of all—thoroughbred horse racing (which I also heard referred to by an Indiana Hoosier as Medieval Nascar), and one of the coolest cities in the country: Louisville. Louisville has a thriving music scene, a notable absence of strip malls, chain stores and restaurants and dare I say it…? A more unique and thriving culture than San Francisco. I arrived late from St. Louis and was picked up by mom, Barbara’s, best friend, also named Barbara. She may be my mother’s age but she can out-party me, and that truly is a feat. Our first stop was Flanagan’s Irish Pub on Bardstown in the Highlands of Louisville. We walked into the middle of a Christmas in July party, amateur night. Barb and I drank some beer and whiskey (Barb has her own mug at the bar, earned by drinking 100+ beers there) and I enjoyed some top-40 country music, anthropologically of course. I finished a pack of cigarettes before I boarded the plane and being in a bar set off an intense cigarette craving. I excused myself from our booth and walked outside to the smoking patio. In the corner of the patio was a guy, about my age, with his hat down low and feet propped on a shut-down outdoor bar. I assumed he was staring at his phone like everyone else does when they are out with their friends. I walked up closer to see that he was asleep with a pack of cigarettes and a beer in either hand. I nudged his arm. He didn’t move. I waited a moment to make sure he was still breathing before delicately slipping the pack out of his hands and grabbing a cigarette. Southern hospitality. The following day Barb and her husband, Chief, had a music tour of their own. We started off by dropping off Chief’s guitar to be repaired by Chelsea Clark, of Guitar World notoriety. After dropping off the guitar, we headed over to theLouisville School of Rock, where Barb is taking singing lessons with Chip Adam, a 25-year music industry veteran who has toured with everyone from John Mellancamp to Farm Aid and currently plays in eight separate bands when he is not teaching. 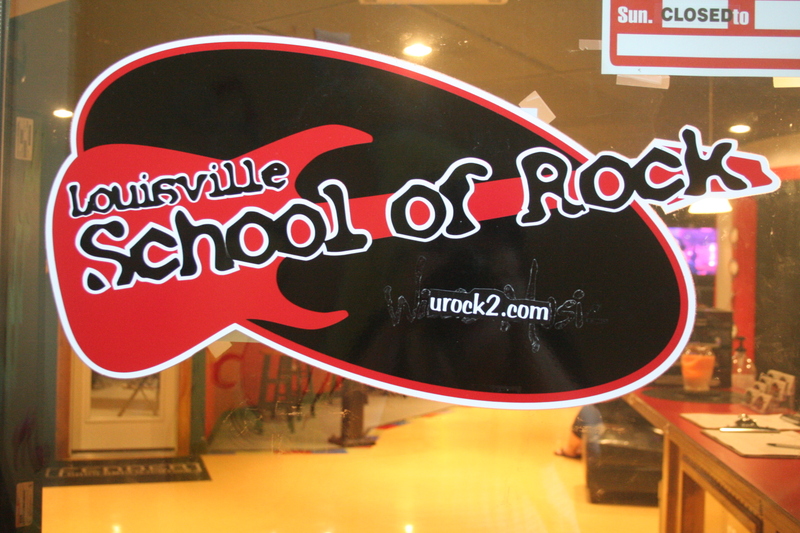 The Louisville School of Rock is unique, the teachers are all seasoned veterans of all genres of the music industry and students have an opportunity to learn, play and record in a studio setting. Next on the agenda, EXTREME PORCHIN’. Porchin’ is an old and well-respected though dwindling Louisville pastime. Friends and neighbors gather in the early evening on couches and chairs on a neighborhood front porch to share stories, drinks, gossip, food… but mostly drink. I porched real hard. I porched so hard, if there was an Olympic gold medal for porchin’, I would take bronze. After a short evening of guitar talk, music lessons and some Extreme Porchin’, Barb, Chief and I headed out to the Bardstown strip in pursuit of the Twisted Sister Family Band… who didn’t actually end up playing that night. 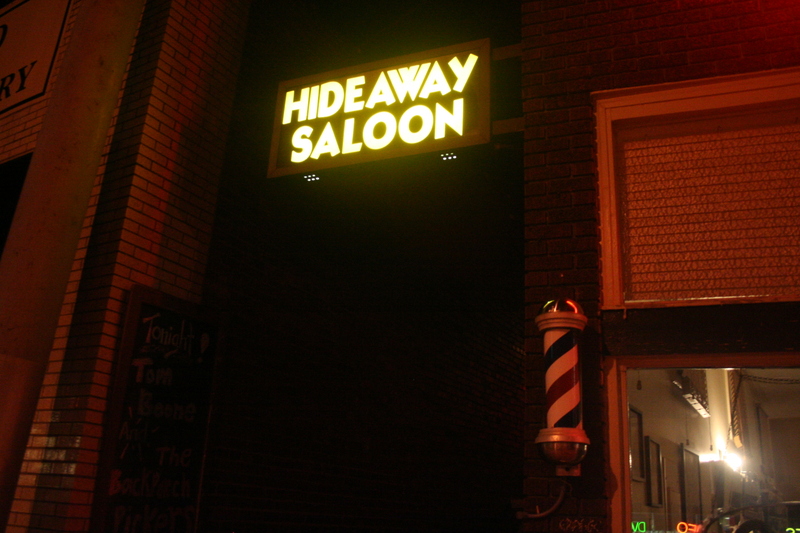 So, instead we headed to the Hideaway Saloon, an appropriately named dive bar hidden from plain view on the busy Louisville street. We were glad we did because instead of Twisted Sister kitsch we found genuine and engaging Bluegrass from Tom Boone and the Back Porch Pickers. By the way, in case you are wondering where the term “bluegrass” comes from (you probably weren’t), the states of Kentucky, Tennessee and parts of other surrounding states sit on top of limestone plates. During the spring rain, the limestone turns ordinary grass a bluish color. Tom Boone and the Back Porch Pickers took a little while to get started, but it was worth the wait. In the meantime, Barb, Chief and I checked out the bar. “Look Ang, they have jello shots here,” she says. “If I get one will you do one with me?” I ask. I order two jello shots and the bartender leans in close to inform me that the lady who makes the jello shots won’t be back til Thursday… but they did have a Fireball Whiskey special, $2 a shot. “I’ll take two!” I say. A few more shots of Fireball Whiskey (it’s like Goldschlager but less sweet… think Atomic Fireball candy-infused whiskey) and the band is ready to play. Let me start with saying that the banter in their live show is just as entertaining and engaging as their music. Spoken like Porchin’ Gold Medalists. 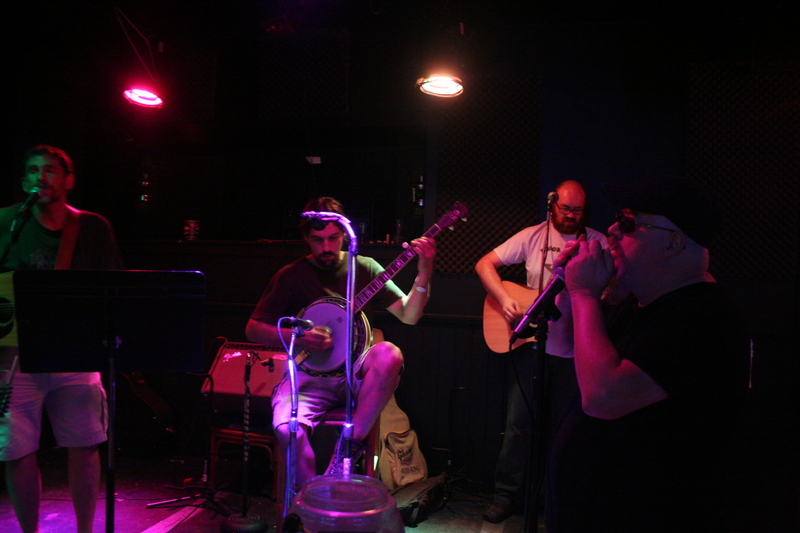 The band is made up of two acoustic guitars; one played by Tom Boone himself (Boone also sings lead), a pro-harmonica player (who never once removed his shades in the dark bar), and a steel guitarist who switches between that and the banjo. All bearded. “That sounds all high-endy and fat,” one of them jokes as the other toyed around with an instrument. They launched into a series of covers, including Woodie Guthrie’s Do Re Mi, “Oh, if you aint got the do re mi, folks, you aint got the do re mi/Why, you better go back to beautiful Texas, Oklahoma, Kansas, Georgia, Tennessee/California is a garden of Eden, a paradise to live in or see;/ But believe it or not, you won’t find it so hot/ If you aint got the do re mi.” Fitting. They played pure Kentucky Bluegrass so genuinely that the instruments all layered together flawlessly, simultaneously creating music and dictating the mood in the bar. Later on I looked up a lot of the old country and bluegrass music they covered… they did it best. They don’t yet have their music on the web for download, but you can listen to Tom Boone and friends on Myspace.com. Tom Boone and the Back Porch Pickers is something I wouldn’t normally listen to back home but I think they converted to me. What better way to spend an hour on the Bay Bridge than thinking about the Louisville, Tom Boone and the Hideaway Saloon? The next day we headed out towards Frankfort, the State Capital, to tour the Bourbon Trail, notably, Buffalo Trace Distillery, the longest consecutively operating distillery in the country. During Prohibition the bourbon industry was shut down in Kentucky, however, Buffalo Trace was allowed to stay open to produce “medicinal” bourbon, which required a government permit to manufacture and a doctor’s prescription to acquire, with a three-pint a month limit. Sound familiar? Most of the distilling process is waiting, it takes at least eight years to age bourbon. Large warehouses hold hundreds of barrels of high-dollar bourbon being aged in the Kentucky summer heat. Stepping into the warehouses and breathing in the intoxicating scent of thousands of gallons of bourbon started giving me a buzz that I indulged further when the tasting began. Frankfort was fun I think. One final Porchin’ sesh and then I was “off like a prom dress to” Charleston, West Virginia.